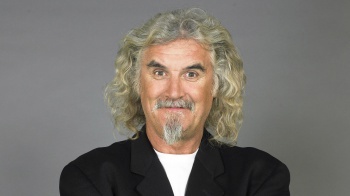 The Big Yin will play a short dwarf for the big screen. Comedy man Billy Connolly, perhaps best known for his role as Il Duce in the Boondock Saints movies (though he's given many a great performance over the course of his career) has been cast in the upcoming Lord of the Rings prequel as Dain Ironfoot, "a great dwarf warrior and cousin of Thorin Oakenshield." With Connolly's role now in stone (iron?) the cast of The Hobbit is officially complete. "We could not think of a more fitting actor to play Dain Ironfoot, the staunchest and toughest of Dwarves, than Billy Connolly, the Big Yin himself," said Jackson during a recent interview with The Hollywood Reporter, then later adding, "We can't wait to see him on the battlefield!" Connolly will join Sherlock boys Martin Freeman and Benedict Cumberbatch in the film(s), as well series mainstays Sir Ian McKellen, Andy Serkis, and others. I really think Jackson made the right move by bringing him in for Ironfoot, after all (and I mean this in the best way possible) the guy already sort of looks a bit like a Tolkien dwarf, height withstanding. The hair and makeup departments are probably cheering louder than anyone. Catch Connolly and the rest on December 14th, 2012, when The Hobbit hits theaters.